Block Island Belly Laughs | Oh My Tiny Little Pea Head! When is the last time you had a real good belly laugh? I’m not talking about a giggle or a chuckle or typing LOL – I’m talking about a good solid full belly laugh. You know the kind that is very natural, usually contagious, and can often happen when you are not supposed to be laughing at all like in church or in front of a police officer. Last weekend was our annual Block Island trip and it was full of belly laughs. We go with three other couples and it’s a good group – everyone is easy going and lots of fun. We laughed all weekend, the kind of laughing that your abs hurt the next day. I can’t go into details because it all stays on Block Island (kind of like Vegas), but everything was funny. I am not sure belly laughs have any actual health benefits, but they are definitely good for you. For me, they were great! You see last year I was still recovering from chemo and radiation, still getting Herceptin treatments every 3 weeks, and doing too much. The weekend prior I took the red-eye home from our California vacation and went right to Dana-Farber early Sunday morning for my Herceptin treatment. Monday it was off to work and back home Thursday night to pack for Block Island. So, by the time Friday afternoon rolled around and we were getting the weekend started on Block Island, I was toast. I was struggling and just couldn’t keep my trooper face going any longer, I really needed to go to bed. So, I did. It helped and I was better the rest of the weekend, but it was still a struggle. I put my trooper face on but I didn’t feel that great and it frustrated me, I just wanted to be normal again. This year I was looking forward to the trip and getting my redemption. Not redemption from the others because they understood and were great. Redemption for me. Redemption came from feeling good, having fun, and lots of very natural belly laughs! It was confirmation for me that I am back to my normal self, no longer the one with breast cancer. So, thanks to Greg & the Block Island crew for a great weekend, I’m smiling just thinking about it! Catching up on your blog!! 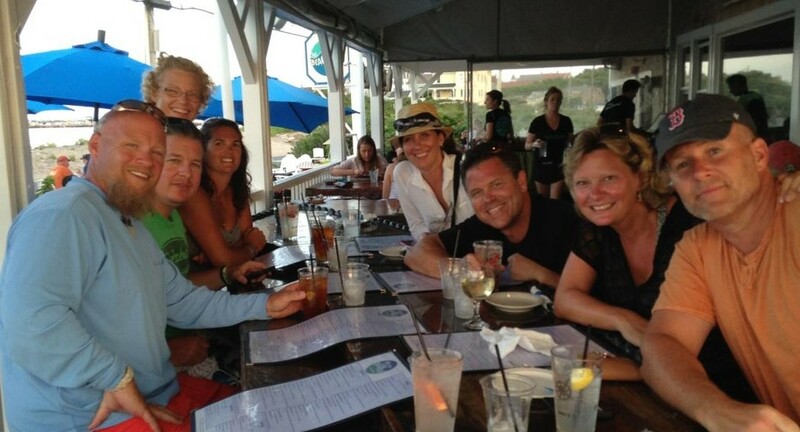 And smiling remembering our great weekend on Block Island…..cant wait for next year!